Prof Axel Bruns | Virtual Environments: Is one life enough? One of the links to the reading material for the week was broken so John gave the class some time to catch up before getting into the discussion around content creation and the concept of ‘produsage’ proposed by Prof Axel Bruns. We spoke of the changes brought about by the migration from the print medium to digital. One of the principal outcomes is the shift from mediated content, where ‘gatekeepers’ such as newspaper editors, publishers and so on, commissioned and controlled the flow of information to the public. Digital media has eliminated this necessity – authors are now free to connect directly with their readers and viewers through blogs, YouTube and even sites like Wikipedia where the public is invited to edit contributions. As a result, consumers of news and information are required to be their own editors. We need to be more discriminating in our consumption, unable to rely on the frame of reference that was previously provided by knowing the perspective of the newspaper we read, for instance. John suggested that your own blogs are another example of content creation. The ubiquity of the internet supports the niche interests in a way that mass media publishing never could. The extremely low cost base means that anyone with access to the web can share their interest with like-minded individuals and develop a community. Finally, I referred to the question of value. Does all content have value? How can content developers monetise their material? How can you protect it? For more on copyright read the post from this time last year A Word about copyright. Read: the short story The Ones who walk away from Omelas by Ursula K Le Guin, 1973 [accessed on 24/11/18]. This week is Spring Break for Akron students so the class was in the DIT seminar room in Dublin for a change of scene. For the first half we discussed progress on the group project and re-emphasised the importance of reflecting on what is not working in the collaboration in addition to what is working. It is important that participants are writing about this in their blogs from now to the end of the semester. The second part of the class consisted of a discussion based around Prof Axel Bruns’ lecture that students had read over the week. At the beginning many professed confusion about what Bruns was proposing but as the discussion progressed it became clear that most understood it better than they realised. It may be that as emerging ‘produsers’ themselves the concept is so familiar that it is almost invisible to them. The concept of wikipedia not being about the creation of finished products but the ongoing revision of information – constantly amended and updated by people who may have originally come to it as consumers but have become content creators – was clearly understood. The development of the distribution system for news from the formality of traditional newspapers that are controlled by editors and publishers to the openness of blogs, Facebook and such systems that have eliminated the gatekeeper was considered – with particular consideration of the pros and cons. The issue of reliability was surfaced, leading to a reminder of the importance of reputation – and brand. As users become the producers of content: people who care enough to participate – as opposed to those who merely want to consume – personal brand becomes increasingly important. DIT students are reminded that their blogs were due for the second assessment (after week 8) but this has been postponed to this week giving you a chance to catch up if necessary. The importance of proofreading posts before publishing was emphasised. Read: about the girl who resigned her position as uk police youth commissioner due to previous tweets (accessed 02/13/15). Read: about another example of a person losing her job over a tweet (accessed 02/13/15). Read: why Dr Phil removed a tweet from his TV show (accessed 02/13/15). Write the ninth post: to your blog reflecting on the benefits and difficulties of collaborating online across time zones. Class 8: Is the medium the message? Last week students were asked to watch a lecture by Prof Axel Bruns but the link was faulty – while the slides accompanying the talk were visible the lecture itself was missing. So, the correct link will be posted this week and we will discuss the idea of ‘Prosumer to Produser: Understanding User-Led Content’ in another class. 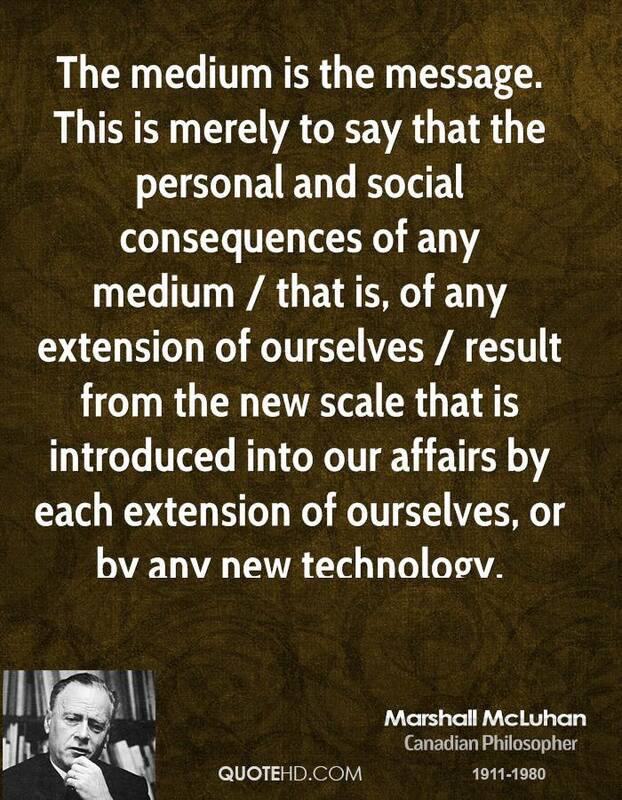 This week in class we discussed Marshall McLuhan’s proposal that the ‘medium is the message’. Use of the smart phone emerged as the dominant theme, particularly the way in which it appears to have replaced face-to-face encounters for many people today. Watch and listen: to the lecture ‘From Prosumer to Produser: Understanding User-Led Content Creation‘ by Prof Axel Bruns (Creative Industries Faculty at Queensland Institute of Technology) explains his theory of user-led collaborative content creation. Write the eighth post to your blog explaining how Marshall McLuhan’s theories inform the thinking behind this class.